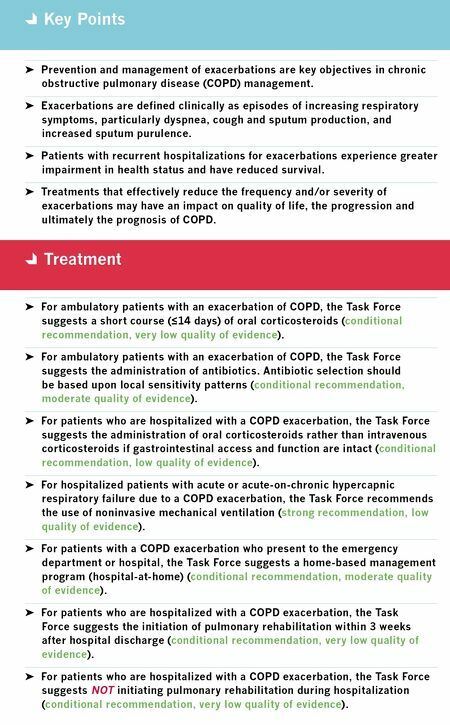 Prevention ➤ For patients who have COPD with moderate or severe airflow obstruction and exacerbations despite optimal inhaled therapy, the Task Force suggests treatment with an oral mucolytic agent to prevent future exacerbations (conditional recommendation, low quality of evidence). • Moderate or severe airflow obstruction is defined as a post-bronchodilator FEV 1 /FVC <0.70 and an FEV 1 % pred of 30–79%. • The beneficial effect of mucolytic therapy on the rate of COPD exacerbations was driven by trials that administered high-dose mucolytic therapy (e.g. N-acetylcysteine 600 mg twice daily). ➤ In patients who have COPD with moderate or severe airflow obstruction and a history of one or more COPD exacerbations during the previous year, the Task Force recommends that a long-acting muscarinic antagonist (LAMA) be prescribed in preference to long-acting β-agonist (LABA) monotherapy to prevent future exacerbations (strong recommendation, moderate quality of evidence). • Moderate or severe airflow obstruction is defined as a post-bronchodilator FEV 1 /FVC <0.70 and an FEV 1 % pred of 30–79%. ➤ In patients who have COPD with severe or very severe airflow obstruction, symptoms of chronic bronchitis and exacerbations despite optimal inhaled therapy, the Task Force suggests treatment with roflumilast to prevent future exacerbations (conditional recommendation, moderate quality of evidence). • Severe or very severe airflow obstruction is defined as a post-bronchodilator FEV 1 / FVC <0.70 and an FEV 1 % pred of <50%. ➤ Fluoroquinolone therapy is NOT suggested as treatment for the sole purpose of preventing future COPD exacerbations (conditional recommendation, moderate quality of evidence). 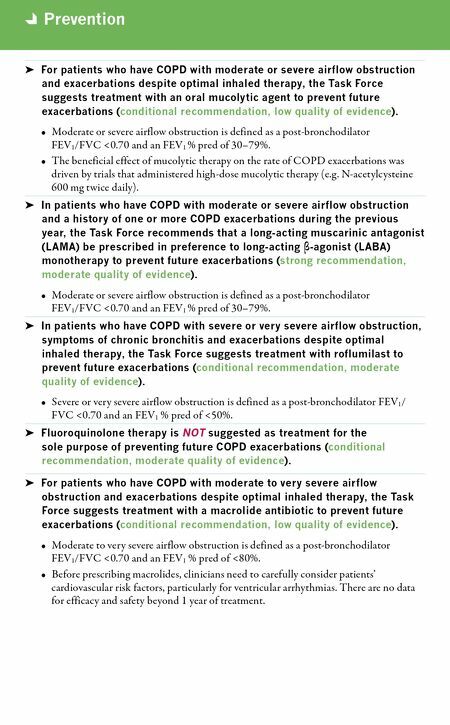 ➤ For patients who have COPD with moderate to very severe airflow obstruction and exacerbations despite optimal inhaled therapy, the Task Force suggests treatment with a macrolide antibiotic to prevent future exacerbations (conditional recommendation, low quality of evidence). • Moderate to very severe airflow obstruction is defined as a post-bronchodilator FEV 1 /FVC <0.70 and an FEV 1 % pred of <80%. • Before prescribing macrolides, clinicians need to carefully consider patients' cardiovascular risk factors, particularly for ventricular arrhythmias. There are no data for efficacy and safety beyond 1 year of treatment.